Disturbances of blood sugar homeostasis after various general surgical Operations have been reported by Schultis (1971), Howard (1955), McNamara, Molot, Stremple, and Sleeman (1971), Ross, Johnston, Welborne, and Wright (1966), and Stremmel (1972, 1974). Hyperglycaemia and also glycosuria were observed and appeared to be related to the severity of the operation or of the injury. The disturbance in the utilization of glucose, which is measurable by a reduction of the K value has been discussed as one of the causes of hyperglycaemia, increased utilization of free fatty acids is supposed to be another one. An increased secretion of anti-insulin hormones is suggested as a further cause. 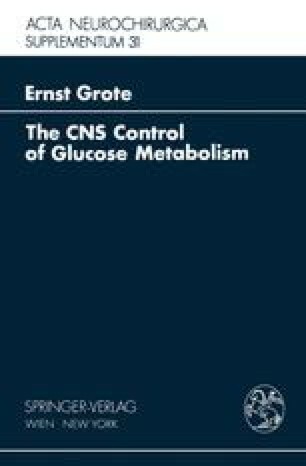 The inhibition of glucose-induced insulin secretion during operation (Allison, Tomlin, and Chamberlain 1969, Stremmel 1972), after burns (Hinton, Allison, Littlejohn, and Lloyd 1971), or after myocardial infarction (Allison, Prowse, and Chamberlain 1967) is regarded as an additional cause for the hyperglycaemia which is seen.